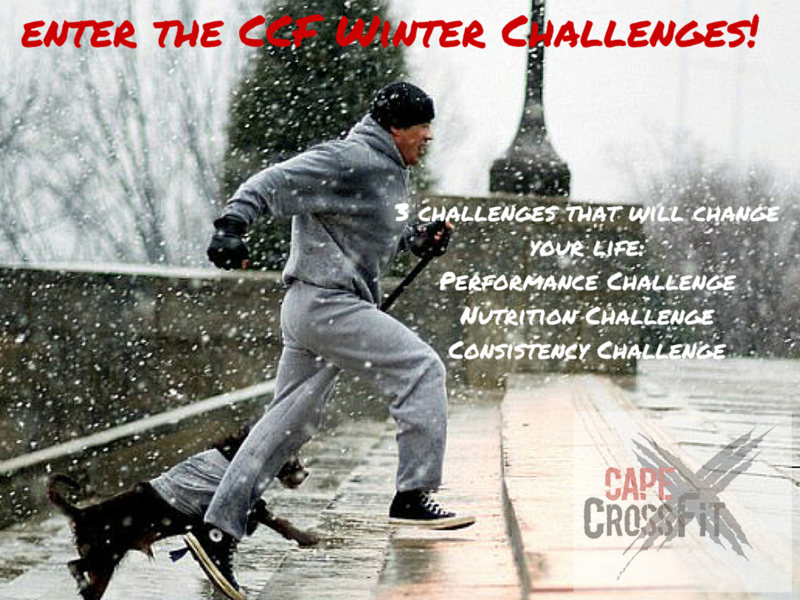 CCF Performance Challenge & CCF Consistency Challenge - the 3 winter challenges starts tomorrow! How much can you improve your fitness in 8 weeks? Short answer: a lot! Tomorrow we will test out two things: a max lift and a classic Benchmark WOD then 8 weeks later we will put you to the test again. Whoever improves the most walks away with not only a massive improvement in their fitness but also all the glory and a wad of cash as all the entry fees goes into the prize pool! Tomorrow we will all be doing the same thing in class: A) 1RM Olympic Lift B) Classic Benchmark with a 10min time cap - hint: it will make you cough... ;) For A, you and a partner will be given 10min to establish a max and then you will take turns doing the WOD. You will be given a score card to sign from you and your "judge" that will then be saved until we retest the challenge in 8 weeks time. You will also be divided in to an "RX" and a "Modified" category depending on how you chose to do the WOD. To take part in the "RX" category you MUST finish the WOD within the time cap. If that is not doable the coach will help you modify the WOD to your capacity. WHAT: 8 weeks Performance Challenge. WHEN: Monday 9th of May in all our classes in all 3 boxes! FEE: R100 CASH ONLY, all goes back to the prize pool. How much can you prioritise your own health and fitness in 8 weeks? Show up for class (1p): Get your attendance sheet signed by the coach. Work on active recovery/mobility in the box (1p): If your body is tired from a few hard days of training you can simply come in and foam roll, stretch, move slowly on a rower/bike etc and still get your point for that day. Goal Getting Session (3p): By simply booking an appointment with your coach and either work on a weakness or maybe just talk through your goals you can earn 3 points for this challenge! Max is 2 Goal Getting Sessions in these 8 weeks. Why do we promote consistency? It's pretty logical: our training works and we want YOU to have the best possible results. By motivating you to show up to class every single day of the week (except Sundays which are rest days in our world) we know that we can further improve your results. We also know that the most consistent members will most likely be the ones doing really well in both the CCF Performance Challenge AND the CCF Eat Healthy Winter Challenge. And yes, for absolutely best results we obviously recommend you to take part in all three Challenges, read here about the CCF Eat Healthy Winter Challenge which can have a dramatic positive impact on your results in both the Performance and Consistency parts by fuelling you with the right stuff! Show up to class tomorrow to set your Baselines for the Challenges and to collect your Score Cards and Attendance Sheets. Show up to class as often as you can every day and reap the rewards! We are behind you and your fitness journey all the way. No Excuses, Only Results.